I’ve read triathlon race recaps that have to be broken up into several parts; I used to complain (to myself) that they were too long, but I think I get it now. A lot goes into these longer races, and my experience at the Barrelman Triathlon fits the bill. I learned a lot, felt a lot, suffered a lot, smiled a lot. So, while I’m not sure how to break up the actual race experience, I’m going to devote this post to everything leading up to my swim start. 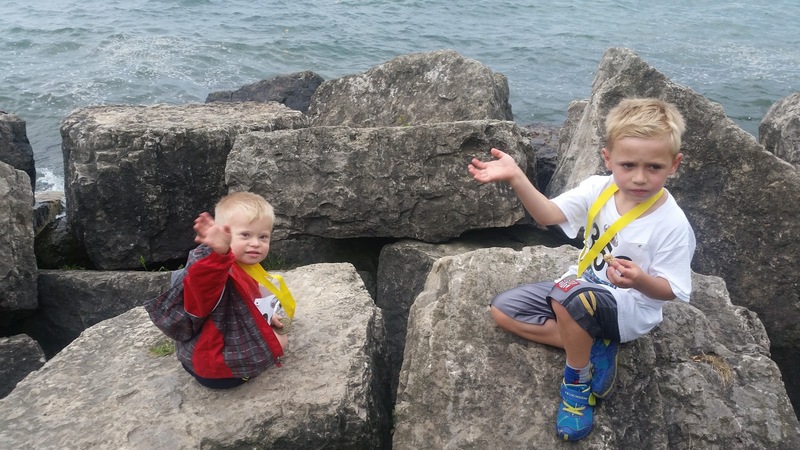 On the Saturday, we took the Kids to Ashbridges Bay for the Beaches Kids of Steel Duathlon. I wanted to devote my energy to getting the Lightning Kid through his first race, and it turned out we had registered Shark Boy for the age 6-7 category, which meant no parents on the race course. Luckily, he’s always been able to roll with changing circumstances, and he’s done enough of these to feel confident. Taking the Lightning Kid through his race acted as a nice little shake-out run for me, and he did a fantastic job. 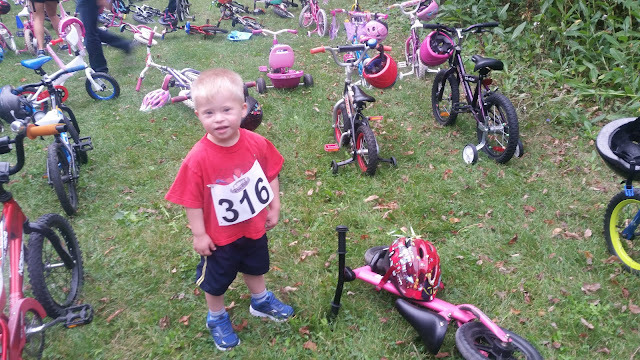 He ran the first leg (50m) hard enough to get a little gassed, and I helped him with his helmet and bike. 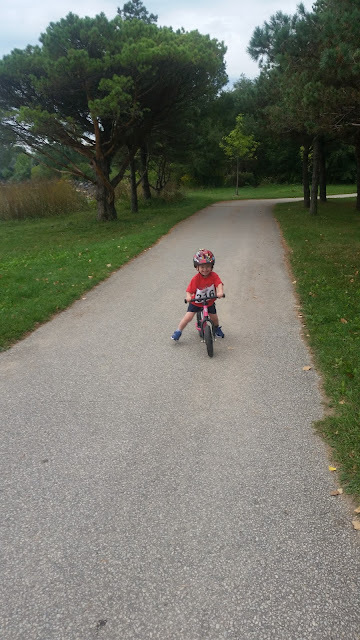 He walked the bike (which he didn’t get to practice much before hand) out of transition to the mount line, and then we took off. There were occasional stops to look at dogs, and I’m actually proud he chose to dismount for the one part where a decline was too steep - discretion is the better part of valour, after all. Not that he lacks guts; he managed to get his glider bike up the biggest incline on the course (600m) and rode quickly back into transition. The way to get him to keep up the pace was simply to say “FAST!”.... I must have said it 100 times in the race. We headed out for the final run (100m) and before I knew it he was crossing the finish line to collect his medal, and his high-fives of course. Shark Boy had to tackle new distances this year. 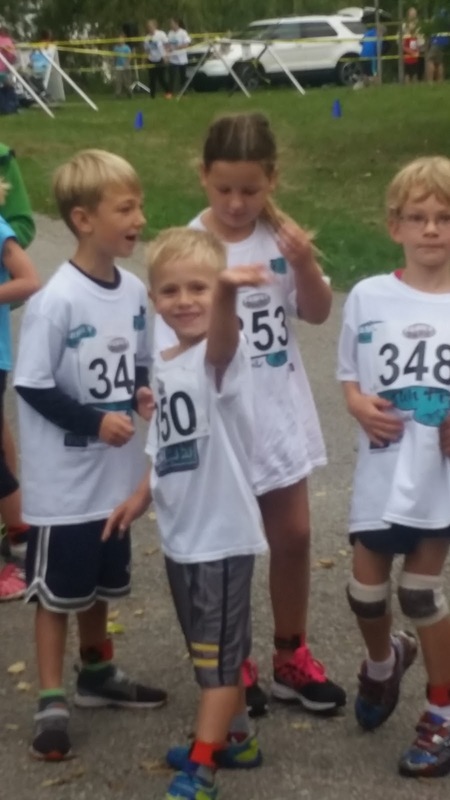 I already mentioned how well he dealt with having his expectations subverted - this was a big deal, since he hasn’t turned 6 yet, and was expecting to win or place in a race where everyone was younger or smaller. In the 6-7 age category, he’s a small fish in the big pond again. He handled all the distances (longer than he’s experienced before 250m run, 1.0km bike, 100m run) no problem, and I explained that running with the big dogs and not coming first was worth more than coming in first in a contest that is easy. He seemed to get it. After a celebratory round on a trampoline they had there, we headed home and I got to packing. I had intended to dash off right after the kids’ race, but with the mandatory athlete briefings at 2:30 and 5:00, I could opt for the second one and linger a bit. I figured I’d be leaving my wife with both of them for the rest of the night, so whatever I could do to lessen the load before leaving was a good move. The Lightning Kid was tired, so I helped get him down for a nap, and apparently the plan was to go see a movie, Shaun the Sheep, which would be the Lightning Kid’s first trip to the movie theatre. I left the house at 2:00PM for the drive to Welland, and got a text message that while they were all playing in the back yard, Shark Boy had locked his mother out of the house in a fit of pique. Guess he’s the one who should have had a nap - not a good sign for peace on the home front. The drive to Welland was peppered with rain showers and some downpours, but the forecast for Sunday/Race Day was good, so I didn’t get too worried; I just didn’t like my bike getting wet on my car roof. 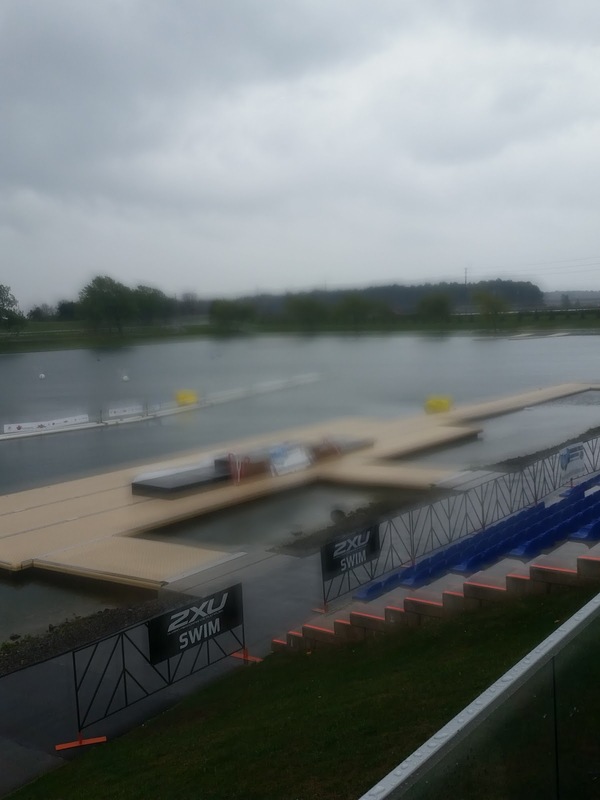 The swim and T1 were located at the Welland International Flatwater Centre which is used for open water races such as Dragon Boating, Kayak, and Rowing. I got my race kit/swag, different gear bags and timing chips. The rain kept me from experiencing the exhibitors at the expo, and some were packing up for the day anyway. I did get a chance to talk to Jessica from LifeSport Coaching about getting our kids involved in multi-sport; getting them on bikes seems to be a common difficulty. 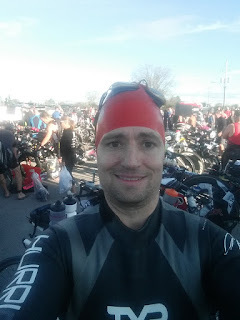 As you can see, I got my race kit, scoped out the swim venue as best I could, spied on bikes and drove to Niagara Falls. During the race briefing, they mentioned several spots on the road where large trucks carrying the blades for wind turbines had damaged the roads. I knew those wind turbines would be an interesting sight on the ride, and it certainly was windy in the general area. From Welland, I made my way to the Chippawa area of Niagara Falls, where I stayed in a cheap motel steps away from Kingsbridge Park where the T2 transition area was to be. I described the motel as a "great place for a drug deal to go bad", it reeked of cigarette smoke, had borderline no hot water, and various other failings, but it had free wifi, the owner was a nice enough fellow, and it was one of the better deals for accommodation in the local area. I organized my gear into the various bags (black was to keep my wet-suit and anything else I would drop in T1 - Welland to be transported to the race finish, red had anything I'd need in T2 for the run, and a clear bag for anything I'd need after the race was done like clean, dry clothes), then tried to go to sleep. I got a late night text message. The Lightning Kid was having difficulty breathing; throughout the cold and flu season this seems to happen. He wakes up wheezing, and difficulty breathing is pretty serious. When we take him to the hospital emergency room, sometimes it's not really anything, but at least once he's had pneumonia. This time ended up being one of the worse ones - my wife stayed up with him from 10 PM to 3 AM before taking him to the hospital - he would be put on an oxygen mask and given oral steroids for the better part of Sunday morning. Plan A had been for my mother to take care of the kids so my wife could take a bus to Niagara Falls and cheer me on for the run portion, and we'd take Sunday night as a romantic getaway. Instead, my mother went to the hospital to assist my wife, Shark Boy went to his grandfather's house for Sunday, and I would race alone. Of course, a big part of me was questioning what kind of man I was, not being at the side of my wife and family, and instead gallivanting about in some vain attempt to prove something... to who? For what? Did I think I was some kind of hero or something? Then I'd argue that I'd come this far (including a fair distance from the hospital and home), and I should try to enjoy the day. So my mindset went from giving my all to simply trying to auto-pilot my way through the race and soaking in some of the experience while fighting the temptation to throw in the towel and go home to take care of business on the home front. I drove to the parking lot of the Rapidsview Park (getting a little lost on the way), with plenty of time to spare. I'm guessing I caught one of the first shuttle buses. Though I joked to the crowd:"Anyone feel like doing a little swimming, biking and running today?" my mood was dark and I mostly kept to myself on the bus ride back to Welland. I verified my fear that I hadn't packed my timing chip into any of my gear bags, it was still back in my car. This is the kind of little mistake that is no big deal when you arrive with time to spare, but the end of the world when you're running late. Fortunately, I fell into the former camp and joked with the volunteers about being in a special little club with other who had done the same. 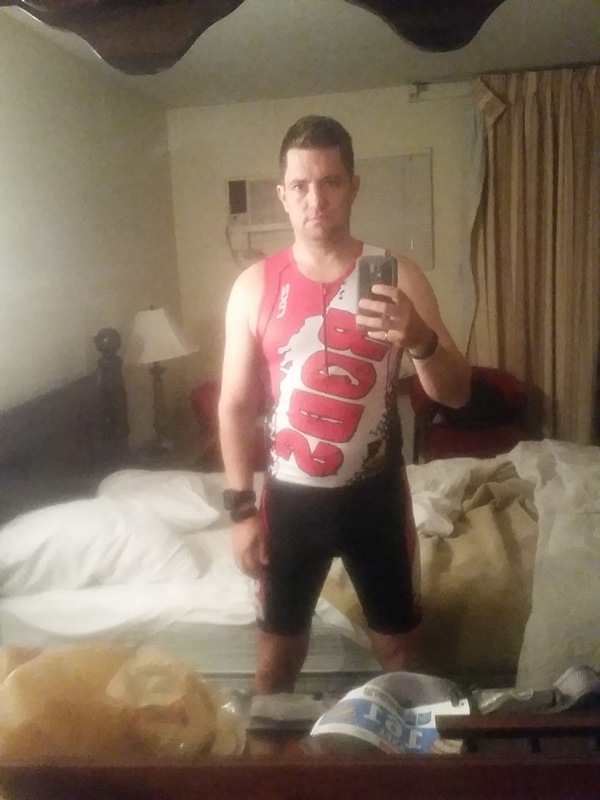 I set up my transition area, including mounting my phone on my bike, but not before I took my last selfie before the swim. I headed down to the water and waded in to get a few practice strokes in. The water was surpisingly warm, and the swim was less about a warm-up than just checking that the wet-suit was on comfortably. I met my friend Peter, and helped him with his Garmin. The elite and first two swim waves went off starting at 9:00 and every 5 minutes after that. You could start on either side of this floating divider, and though they encouraged faster swimmers to go on the far side of it, the far side was more crowded so I ended up floating on the side closer to shore as I waited for the horn to go off. I had a long day ahead of me. You can still donate to my RODS Racing Page to aid in the adoption of an orphan with Down syndrome.